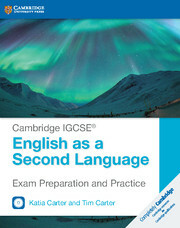 This book supports students preparing for Cambridge International Examinations IGCSE English as a Second Language (0510 / 0511 / 0991). The full-colour exam preparation and practice book contains four guided practice tests, audio and video to build confidence ready for the revised exam from 2019. It takes an active learning approach with a test-teach-test methodology. This encourages students to think about how they are developing language skills, helping them progress. Full sample answers with examiner comments and grades are included to help students understand what is required in the writing and speaking exams. This is part of the Cambridge IGCSE ESL toolbox of resources – the widest choice of resources for this qualification. Four scaffolded practice exams help students build language skills and confidence. The tests prepare students with exam awareness, strategies and practice. Downloadable video of mock oral examinations with international students and examiners helps learners understand what to expect in the real exam. Students can practise listening skills at home with audio CDs. Sample answers, examiner comments and grades help students understand what success looks like. Full colour and easy to use. Written by expert examiners and current teachers.